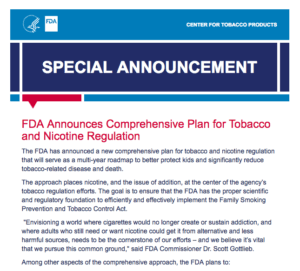 FDA’s New Comprehensive Plan for Tobacco and Nicotine Regulation Extends Application Deadlines for ENDS & E-Cigarettes Today, the FDA announced a new comprehensive plan for tobacco and nicotine regulation. The plan consists of a “multi-year roadmap” to address tobacco-related disease and place nicotine at the center of regulation efforts. Specifically, the FDA will focus its efforts [ ] The post FDA’s New Comprehensive Plan for Tobacco and Nicotine Regulation Extends Application Deadlines for ENDS & E-Cigarettes appeared first on Brown & Charbonneau, LLP. Previous Previous post: What are Class Actions and How Do They Impact Businesses? Next Next post: FDA Again Extends Deadlines for E Cigarette / E Liquid PMTA Compliance to 2022!